Title: 'Estats De L'Empire du Grand Seigneur dit Sultan et Ottomans Empereur des Turcs...', Paris, 1719. From 'Le Nouveu et Curieux Atlas Geographique et Historique'. An elegant small map of the Turkish Empire, with an inset of Barbarie, by Jacques Chiquet. 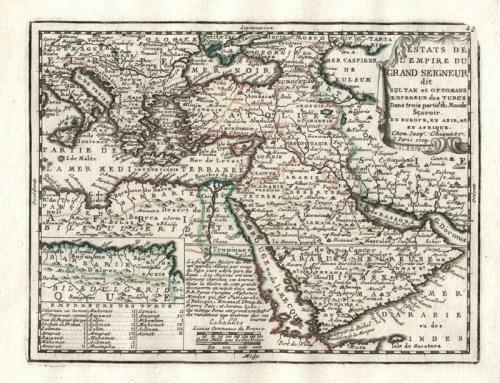 This map is quite rare and is noted for the precision of the engraving. The map shows the extent of the Turkish empire including the Arabian peninsular and part of Europe. Original outline colour distinguishes the provinces and a panel at the lower right lists the names of the Turkish Emperors. There is a decorative title cartouche at the upper right. The map is in excellent condition with wide margins. There are some small binding holes well away from the image area in the left margin. These should not hinder framing.